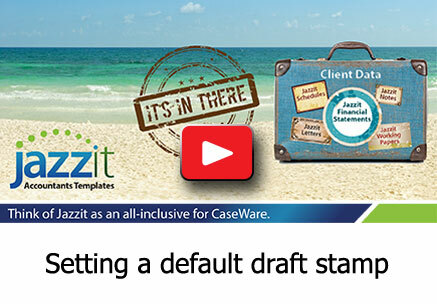 How do I change the default draft stamp setting in the Jazzit financial statements? 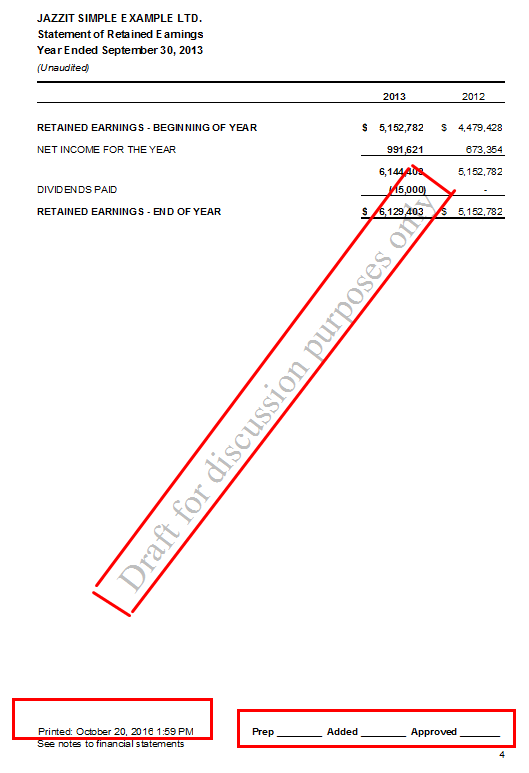 By default the Jazzit financial statements will display a draft stamp when printed. When the file is complete and ready for final print, the draft stamp is turned off via: Home menu > Display > Draft. 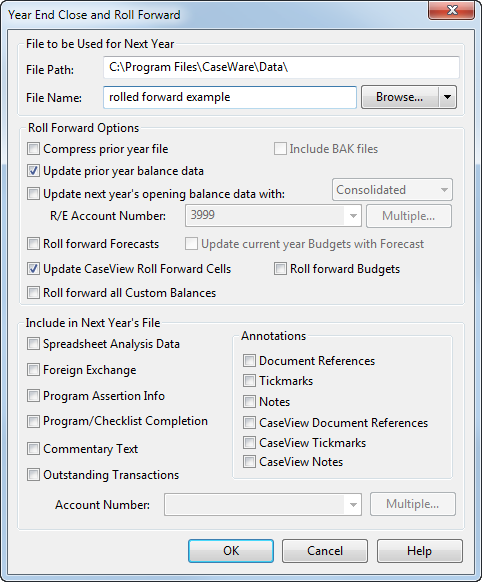 When the file is rolled forward using Engagement > Year End Close in CaseWare, the setting will default to On – date stamping & initials. The default can be changed in the Home menu module (CP) located in the Resource centre. Open your Resource centre (KLIB or FRMLIB) using CaseWare. 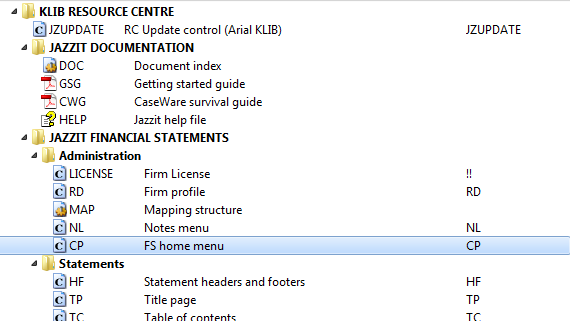 In the document manager open the FS home menu module (CP). Unlock the module by clicking on Home > Lock/Unlock and entering the administrator password. Click the dropdown located under Draft stamp on roll forward to set the default draft stamp setting. 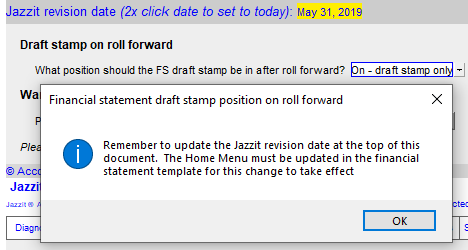 A change to the dropdown will trigger a message, reminding you to update the Jazzit revision date at the top of the document. Updating the Jazzit revision date will help remind preparers to update the Home menu in their files. Double click on the date at the top of the document to change the revision date to today’s date. Close and save the module. Open the financial statements and reload the Home menu from: Home menu > Admin. You may notice that the draft stamp setting will not immediately change upon reloading the Home menu. The setting comes in affect when you roll forward the file in CaseWare via: Engagement > Year End Close. On – date stamping & initials – A draft stamp and print date stamp appears on all pages. Initials boxes appear on most pages. On – date stamp only on title page – Draft stamp prints on all pages. Print date displays on the title page only. On – draft stamp only – Draft stamp prints on all pages. Off – final print – No draft stamp, print dates or initials will appear in the financial statements.